It’s funny that Chase Utley will now be best remembered by Mets fans for a moment during which he was wearing something other than a Phillies uniform. I might have been able to include Utley here for all of the damage he did during his tenure in Philadelphia. He has slugged 35 homers against the Mets, his most against any team. His former teammates Ryan Howard (45) and Pat Burrell (42) have hit more against the Mets, but Utley always felt like the heart and soul of the Phillies during their successful NL East run from 2007-2011. If exorcising demons is your thing, it was appropriate that the Mets would run into longtime foes Utley and Jimmy Rollins in last year’s NLDS against the Dodgers. 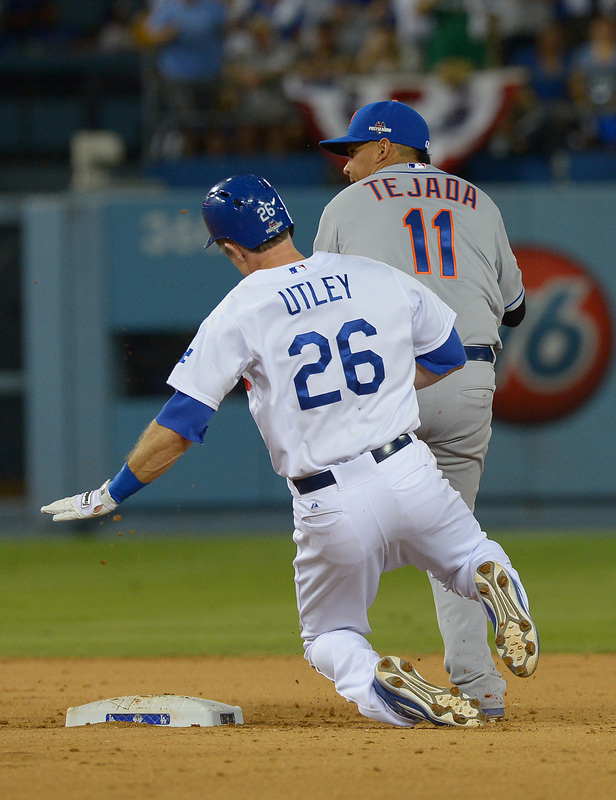 However, it was no longer cute when Utley made a reckless “slide” — really, a rolling block — into Ruben Tejada in Game 2. And somehow, after a replay review and Tejada getting carted off the field with a broken leg, Utley was allowed to stay at second base (despite never touching it during play). The slide tackle changed the game’s complexion and clinched Utley’s status as an all-time Mets Villain. You can make an easy statistical case for Derek Jeter, Mets Villain. His .364 batting average (131-for-360) is third-best all time for players with at least 100 at-bats against the Mets. Indeed, that .364 batting average was Jeter’s highest against any team (minimum 40 at-bats). As shown in the chart below, Jeter’s OPS against the Mets, as compared to his performance against all other teams, ranks 11th in history. Superlative regular-season and even World Series statistics aside (in the 2000 Subway Series, Jeter hit .409 and a certain home run, winning the Series MVP), Jeter is a Mets Villain because he represents a paradigm shift in New York baseball fandom. Before Jeter — and, thus, before his team reached the playoffs every year from 1995 through 2007 — it was possible to be a New York baseball fan. When your favorite team, the Mets, was on a west-coast swing and you had to go to sleep before the late games started, nobody questioned your choice to turn on the Yankee home game and root for the other local nine. Sometimes you’ll read a magazine profile of someone and come away thinking, Why did they ever agree to that? The pinnacle of the art form — at least in baseball circles — might well be Jeffrey Toobin’s 2011 New Yorker profile of Fred Wilpon, whose ownership tenure on the field has been a morass of underachievement sprinkled with little blips of excitement. Off the field, there has been a near-endless string of embarrassments, from the Bernie Madoff debacle (which makes up the narrative bulk of Toobin’s piece and makes Wilpon look clueless, if not downright incompetent) to the discrimination lawsuit involving Jeff Wilpon that was settled last year to the inexplicable reluctance to re-sign Yoenis Cespedes this past offseason after a second-half explosion that led to a shocking World Series run. Bud Selig and MLB have enabled and protected Wilpon and his partners time and again over the years. That policy continues with no end in sight. Terry Pendleton had a nice career. He won a few gold gloves and an MVP. He compiled ~33 WARP across 15 seasons in the bigs. That is a very good major league ballplayer. In my head, I thought he was a bit better hitter than his .270/.316/.390 final line. Even playing the bulk of his games in the late­ eighties and early nineties, that only comes out to a .252 TAv. He must have been better against the Mets, no? That’s why I must consider him a Mets villain (and it would also explain my misrememberings). Nope, his performance against the Mets was right around his career line. Sure, he played for the mid-eighties Cardinals teams that clashed with Keith, Doc, Darryl and company, but was he more of a pest than Jack Clark or Willie McGee? I started rooting for the Mets in 1987. In my twenties, I wore this as a twisted badge of honor. I’ve seen things, man, and none of them were a Mets World Series victory. Functionally, of course, I remember very little of the 1987 season. I was five. My Mets fandom comes from my maternal grandparents’ side. They lived in Florida at the time, and when they’d call we’d talk about the Mets box score from the previous night’s game. This is also how I learned how to read, box scores and gamers from the Hartford Courant. A lot of this comes to me second-hand from my parents of course, abiding memories are hard to come by when you’re five. I do have one memory of that season though. I hate Terry Pendleton. The culprit was likely this game. The Mets had a chance to reel the Cardinals in late in the season. It was a brutal loss looking at the box score. I may have seen the game. I likely read the AP report the next day in the Courant. I don’t remember either of those things, though. I just remember I hate Terry Pendleton. This is silly, of course. I am an adult, I should put away childish things. And I don’t really hate Terry Pendleton nowadays. From 2007 until his inglorious exit from Philadelphia in 2012, no one captured the enmity of Mets fans more than Phila talented switch-hitting centerfielder. Victorino was not, like many of the other players listed here, a traditional “Met Killer.” He put up something very close to his career line in games against the Mets. Victorino doesn’t even have the signature backbreaking moment, just a couple of garden-variety walkoffs like every other longtime division foe. What Victorino was to the Met fan was a constant agitator. He slid a little too hard (and years later, praised another member of this list who slid far too hard). He said a little too much to the media. He did a little too much celebrating on the field, famously mocking Jose Reyes home run celebrations in the 2008 playoffs that the Mets weren’t even in. He’d bend the rules, and then whine to the umpires. He was the perfect player for a rival fan to love to hate. Baseball fans may think of Yadier Molina as a two-way catcher and seven-time all star. But back in 2006, Molina hit .216/.274/.321. To put that in historical perspective, Kevin Plawecki struggled his way to a .241 True Average last year. Molina’s TAv in the 2006 regular season was .201! In the playoffs, Molina must have suddenly discovered how to hit during one of his countless trips to the pitcher’s mound. On the list of Met-killers, perhaps Burrell doesn’t have the same cache as the Chase Utleys and Chipper Joneses of the world. But if you look at the top-10 home run hitters against the Mets, you’ll find a laundry list of Hall-of-Famers starting with Willie Stargell (60 anti-Met dingers) and ending with Andre Dawson (36 homers against the Amazins). The only two people in the top 10 neither enshrined in nor heading to Cooperstown are No. 6 Ryan Howard and No. 7 Pat Burrell. This is missing John Rocker, but good list otherwise.